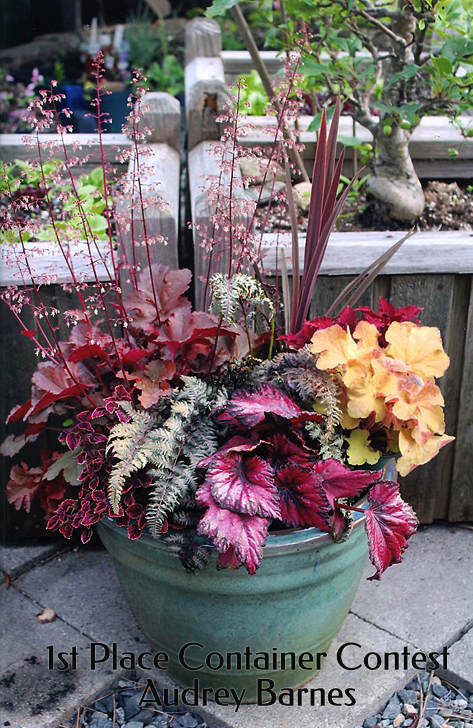 Please share your container ideas with your fellow garden club members by taking some photos and entering the club’s container contest. In November, all club members get to view and evaluate the containers. While this is not a photo contest, how your container is judged is dependent on how the photograph portrays it. For this contest, the member entering the contest does not need to be the photographer. 1. The contest is open to all paid-up NWHS members as of the October 2017 general meeting. 2. Each member can enter up to 3 (three) entries. The entries can be containers, hanging baskets or a coordinated group of containers and baskets. They must be obvious separate entities. A section of a raised bed does not qualify. 3. Each entry must have been created by the entrant. 4. Up to three photographs of each entry may be submitted. For example, you can include a summer and winter view—or an over-all and partial view. The container itself may have been created at any time, even prior to October 1, 2017. However, the photograph(s) must have been taken within the October 1, 2017 and October 14, 2018 time-frame. 5. Photograph dimensions allowed: if in normal format, up to 5” x 7”; if panoramic, either width or length must be 5” or less (i.e. 5”x10” is allowed but 6”x12” is not). 6. The photographs of the entries accompanied by a list of all plants used in each entry are to be submitted at the October 2016 general meeting. Put your name on the plant list. It is optional whether or not you include a title or specify the growing conditions for your container. At the meeting, there will be a supply of large envelopes available. Use one for each for each entry. Just put your photographs and list inside. No need to write anything on the envelope. 7. All entries will be posted at the November meeting. Judging will be done via secret ballot by your fellow NWHS members, each selecting the one container they consider “the best”. 8. Awards will be given for first, second and third placings. No member can win all three prizes. Honorable mention is a possibility. If two or more placing containers receive equivalent number of votes, a tie will be awarded. 9. The first place winner will receive a $15 cash prizes; second place, $10; and third place, $5. Awards will be presented during the club’s annual awards ceremonies in December. At that time, a large poster highlighting the winning entries will be displayed. Share your delight in discovering the intricacy of a specific colour, a visit by something into your garden or a beautiful garden view through photography. In trying to take the best pictures that you can, you will find that you are really looking at what’s in your view finder. In no time, you will be looking at gardens differently. You will see things that you previously overlooked. Soon you will have a new, more intense appreciation of gardens and your plants. 1. For the sake of the contest, ‘garden’ refers to a place cultivated by humans. Wilderness is not a garden. 2. Macro images cannot be entered in the visitors, colour or view categories - only in the macro category. “Macro” means extreme closeup. If a photo is printed 4” x 6”and the subject is life size or larger, it is a macro image. 3. The contest is open to all paid-up NWHS members as of the October 2017 general meeting. 4. Photographs must have been taken by the entrant. 5. Photographs must have been taken after October 1, 2017. 6. There is a limit of 3 (three) photographs per category by any member. 7. Photograph dimensions allowed: normal format, up to 5”x7”; if panoramic, either the width for length must be 5” or less (i.e. 5”x10” is allowed but 6”x12” is not). 8. Entries are to be submitted at the October 2017 general meeting. At that meeting, obtain your unique exhibitor number from the Show Chairperson. Put that number, not your name, on the back of each of your photographs. There will be a large envelope designated for each category. Put your photographs into the appropriate envelope. 9. Judging is done by a qualified judge who is not a NWHS member. He has the option to move a photograph from one category to another if he deems it to be incorrectly submitted. For example, he will move a photograph from Visitor to Macro, if the photograph is obviously a macro image. 10. Awards will be given for first, second and third. No member can win all three places in any category. Honorable mentions are a possibility. 11. The first place winner in each category will receive a $15 cash prize; second place, $10; and third place, $5. Awards will be presented during the club’s annual awards ceremonies in December. At that time, large posters highlighting the winning entries with the judge’s comments will be posted. All other entries will also be on display. 1. Visitors in the Garden: Can be something living or a representation of something living. I.e. may include humans, animals, insects, fish or even gnomes and statues. The photograph must be taken in your own garden. “Visitor” does not include a vegetative visitor - sleeping is okay. 2. Colour in the Garden—Orange (pale peach to deep rust).. Best capture of the colour orange in any garden. 3. View of NWHS Garden: Can be an over-all or partial view of any NWHS member’s garden. 4. Macro Image: Must be a macro photograph. Can be of any subject matter in any garden. “Macro” means extreme close-up. In a photo printed 4” x 6”, and the subject is life size or larger, it is a macro image. "Want to take better pictures of your garden? Try this excellent resource!" Copyright 2016 New Westminster Horticultural Society - All rights reserved.